A unique “Erinnerungsort”, or 'memorial site', in Erfurt, Germany, about the company J.A. Topf & Söhne that provided the SS with the crematoria ovens for Auschwitz and other concentration camps. It lays bare some of the most stunning evidence for the voluntary co-operation (for profit) and unquestioned complicity of parts of the German industry in the Nazis' industrialized mass murder in the Holocaust. More background info: The company Topf & Söhne traced its origins to the year 1878 when Johann Andreas Topf (hence the initials in the later full company name) started a business for incinerator production. It remained a small-scale firm until the business took off in the second generation under the sons Ludwig and Julius Topf – hence the “& Söhne” addition in the name. By 1914 the company had grown into a big player, not just nationally but also exporting worldwide, and it had several hundred employees. The third generation sons Ernst Wolfgang and Ludwig Topf began working in the company in 1929 and 1931 respectively. At the time the company was in turmoil, due to the Great Depression, and the directors of the firm even fired the heirs – but after both joined the Nazi party after 1933, their loyalty soon paid off and they were allowed to re-enter Topf & Söhne as company managers, later becoming sole owners. They lead the firm from 1935 to 1945. When the death rate in the nearby concentration camp of Buchenwald began to rise sharply, due to epidemics and ever larger numbers of inmates, the SS officers running the camp faced the problem of how to dispose of the bodies. Until then they had usually taken them to local municipal crematoria, but that was no longer sufficient given the numbers. Also there was the possibility of too many people finding out about the large numbers of the dead. What was now needed was an on-site system for disposing of the corpses, preferably in secret and with maximum efficiency. And so they turned to the local specialized industry and found the required expertise at Topf & Söhne. At first the company supplied mobile crematoria ovens, but soon it became clear that that wouldn't do and larger-capacity stationary installations were required for the purpose. Unlike in regular crematoria no coffins would be burned with the corpses, so the doors to the ovens were significantly smaller. Moreover, no provisions for separating the ashes of different corpses were made. Priority was not piety but productivity – fast disposal of the dead. Also the ovens featured double muffles (that's the technical term for the furnace chambers inside the oven) that were interconnected, to increase efficiency. 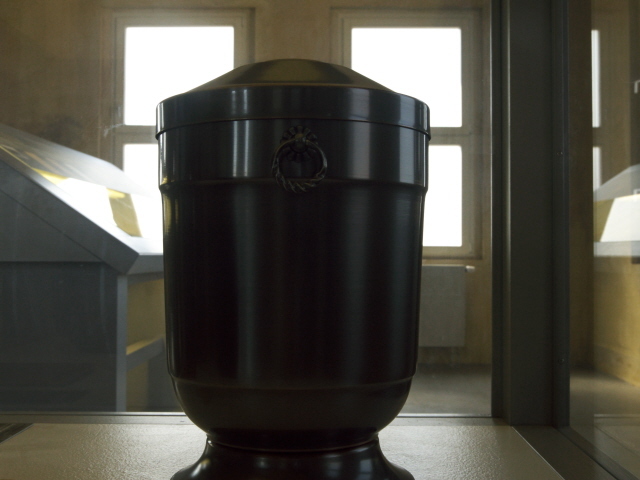 The mixing of the multiple bodies' ashes meant that when relatives of victims requested an urn with the ashes of their deceased (which they could up until 1942, though only “Reich” Germans had that “privilege”), the SS simply packed a random portion of ashes into an urn, and sealed it with a named lid just like a regular urn. It was complete deception. 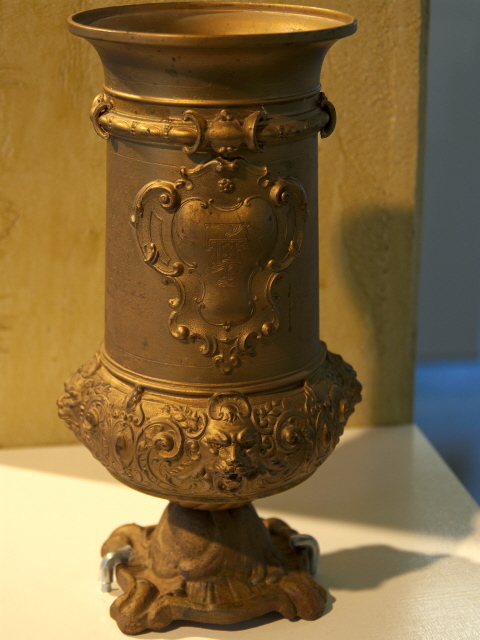 The urns and lids/seals, by the way, were also supplied by Topf & Söhne. It has to be pointed out that Topf & Söhne didn't act on orders. It was a pure business relationship, one they could easily have declined without having to fear any reprisals. The work for the SS also wasn't especially profitable – only a relatively small proportion of the overall turnover of the company came from the SS-commissioned ovens. Moreover, the SS was often late in paying the bills, so was a rather unreliable client. And still they co-operated – apparently it was enough that the Nazi regime requested it, so the company complied. 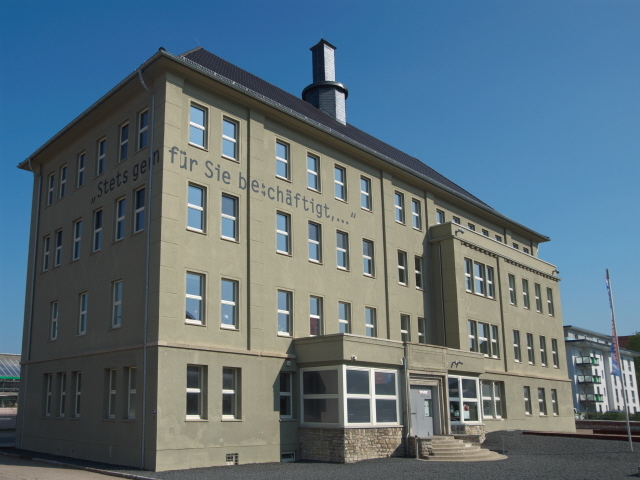 Yet Topf & Söhne did not have a monopoly in this business – there was one competitor, the company Kori GmbH (Kori Ltd.), which for instance supplied the ovens for the concentration camps in Flossenbürg, Ravensbrück, Sachsenhausen, Stutthof, Majdanek and Natzweiler. That Kori company continued to exist after the war as a family business in West Germany (as specialists in heating systems) until the year 2000, when it was bought up (the descendants of the former owner family were approached but were not willing to co-operate in the research project that prepared this exhibition). Topf & Sons ended up supplying the ovens for Buchenwald, Dachau, Mauthausen, Gusen, Groß-Rosen and Auschwitz. The latter was a special case amongst these. Since Auschwitz-Birkenau was not just the largest of all the concentration camps but also became a death camp, the industrialized nature of the mass murder in the Holocaust was most obvious here. The company's involvement in this already began in October 1941 and lasted right through to 1945. One name that has to be mentioned here is that of Kurt Prüfer, the company's engineer who specialized in the design of crematoria ovens and the man who was most eager to use this opportunity for his own gain and career advancement. He designed high-capacity triple-muffle ovens specially for Birkenau and later even bigger ones. He was so proud of his designs that he even had them patented. Yet he felt underpaid and under-respected in the company and at one point threatened to leave. At this point it would have been easy for the company to get out of the dealings with the SS, but instead they granted Prüfer a pay rise and more responsibilities. Prüfer was present in Auschwitz and personally oversaw the installation of the ovens himself – and in doing so he was fully aware of what the nature of the camp was. He even supervised inmate forced labourers himself. And at one point he reportedly caught a glimpse of a gas chamber with dead bodies in it. But that observation wouldn't even have been necessary to realize what all this was for. The huge capacity required (800 corpses per day per oven!) was a clear enough giveaway that what was being conducted here was industrialized mass murder. Topf & Söhne eventually also provided their expertise for the design of new gas chambers themselves, by installing ventilation systems for them, so that the poison gas could be pumped out quickly and be replaced with fresh air after every killing batch – again in order to increase the efficiency and speed of the killing operations. So the complicity in making the “Final Solution” technologically possible is really undeniable. Prüfer went even beyond that. Taking a hint from the Nazis that the capacities might even increase further even after 1944/45, he began – without any orders, of his own accord – to draft designs for even higher capacity ovens for the future. It didn't come to that, of course. In January 1945 Auschwitz was dissolved, and the crematoria blown up to conceal some of the evidence before the camp was liberated by the Soviet Red Army. Topf & Söhne were involved, too, in dismantling and transporting away some of the installations, intended to be reassembled at Mauthausen (which also didn't happen in the end). After the end of WWII, the company denied any complicity in the crimes of the Nazis, the bosses insisted that they hadn't known anything about what their ovens were used for. Feeling “betrayed” Ludwig Topf even committed suicide in the summer of 1945, while his brother fled to the West, where he was put on trial but let off (exactly why is still unknown – the files were never released). Afterwards he even tried, though with less success, to reopen a crematoria production company in West Germany, still using his name Topf, until it went bankrupt. Kurt Prüfer was initially captured by the Americans but released. He returned to Erfurt but was later arrested by the Soviets who eventually sent to a gulag where he died in 1952. His interrogation supplied a lot of answers to how deeply involved Topf & Sons really were in the Holocaust. One employee at Topf & Söhne, Heinrich Messing, got away especially lightly and in the early 1950s in the GDR even managed to get officially recognized as a victim of the Nazis (!! ), simply because he was a communist. That was apparently enough for the GDR to rehabilitate him and overlook his part in the Nazis crimes. Messing had indeed been imprisoned by the Nazis in a “protective custody camp” in Erfurt and was assigned to work at Topf & Söhne, where he was part of some resistance group. Yet he was also present in Auschwitz and worked on fitting the gas chamber ventilation system as well as the lifts carrying the corpses up to the crematoria. He only got his recognition because he and a colleague vouched for each other. Both soon afterwards started working as unofficial collaborators (“IMs”) for the GDR's Stasi as well. The Topf & Sons plant in Erfurt was initially seized by the Soviets after the war. In the GDR era it was continued as a VEB, “Volkseigener Betrieb” ('people-owned company'), but now specializing in building not ovens but maltings, granaries and their ventilation systems (which had already been a sideline of the company during WWII). No responsibilities for the company's dealings in the Nazi era were accepted – even though some of the staff carried on working for the VEB – it was all squarely blamed on the previous capitalist owners. After the collapse of the GDR and the reunification of Germany in 1990, some descendants of the Topf family briefly tried to reclaim their former company in Erfurt. But that caused an outcry and was denied. The plant was privatized but quickly folded in 1994. After that the complex lay abandoned and became increasingly dilapidated (and going by the photos I've seen it must have been a cool attraction for urban explorers back then!). To prevent demolition, left-wing activists squatted in the former factory from 2001 to 2009. Like some local historians they demanded that the complex be protected and turned into a memorial. But in the end all of the former factory buildings were demolished (after the police had evicted the squatters) and the area subsequently redeveloped. Only one structure was saved, namely the administrative building – which includes the very rooms where the design offices of Prüfer and his colleagues were located. The house was thoroughly refurbished and the current memorial exhibition was opened in 2011. It goes back in part to an earlier travelling exhibition that was put together by the Buchenwald and Mittelbau-Dora memorials as well as the Auschwitz State Museum and the Jewish Museum in Berlin. But the original plant as such is now gone (instead there is a new business district there these days). Still, after having been largely forgotten, this story of German business involvement in the Third Reich and the Holocaust now has a fitting place (officially called “Erinnerungsort”, 'memorial place') where it is properly acknowledged. What there is to see: The building that the exhibition is housed in is about the only original part of the former Topf & Sons plant that is left. Outside, though, around the square in front of the building a few remnants of the gate and perimeter wall also survive and a few information plaques point these out. Also in the square is a rusty metal relief model of all the buildings the plant once had. But the main thing is still the former administrative building. The line painted on the north-western corner between the second and third floors reads “Stets gern für Sie beschäftigt” ('always happy to be working for you'). That was a line used to sign off in the company's correspondence with the SS. The main permanent exhibition inside the building is bilingual throughout, in German and English (and the translations are of very good quality!). It mostly consists of text-and-photo panels and documents but there are also a few artefacts. The ones dominating the first room are two drawing boards that would have been used in the design offices of Topf & Söhne. One of them has some technical drawings by Kurt Prüfer (see above) projected onto it. Overall, it is a very text-heavy type of exhibition, which lies in nature of what is commemorated here, of course. Most of the evidence of the company's involvement with the Nazis comes from their correspondence and design sketches. Paperwork. Hence the German expression “Schreibtischtäter” (mistranslated too literally in this exhibition as 'desk murderer') which is used to refer to people who've not physically committed the murders but made it possible through paperwork. Of course, some at Topf & Söhne were more than just “Schreibtischtäter” in so far as they were present at Auschwitz constructing the crematoria (and new gas chambers) actually at the site. Amongst the few concrete artefacts are a decorative pin with the company logo and urns made by Topf & Söhne, including an urn lid marked “Buchenwald”. At one window your attention is also directed to the fact that from here you can actually see as far as the Etterberg mountain where the concentration camp of Buchenwald was/is. 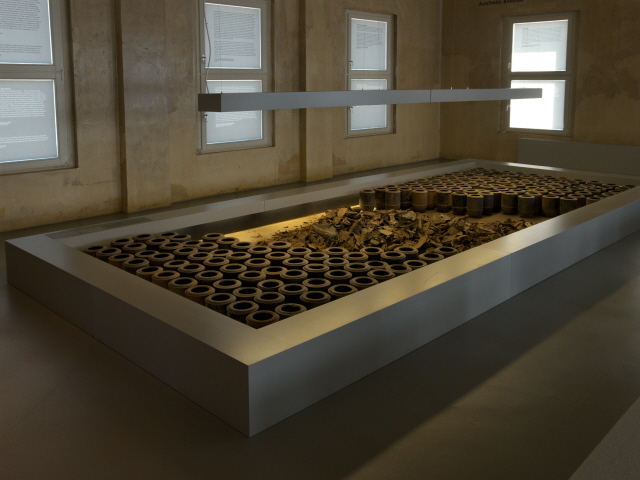 There is one large installation consisting of dozens and dozens of urns in rows within a low rectangular box. 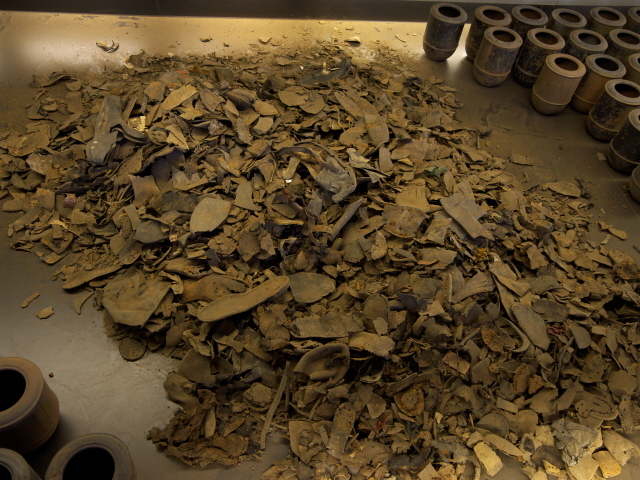 And in the middle are remnants of shoes and shreds of rags, presumably relics from a concentration camp. Here you can also sit down and listen (on high quality headphones) to reports from survivors who had worked in the Sonderkommando at Auschwitz. Through the texts and documents you get a pretty thorough insight into the story of the company, its involvement with the Nazis and the historical context of the Third Reich. Be warned, though, it can be quite harrowing reading the details of the “processing” of victims at Auschwitz, especially from the Sonderkommando accounts. The sheer monstrosity of this most thoroughly planned and executed, industrialized mass murder operation is extremely hard to take in. Even though I've been to Auschwitz itself and have long known about what went on there, reading it here again in such technical detail and in the “cold” context of “doing business” made me feel quite shell-shocked at times. Also interesting is the section about the post-war (non-)commemoration and/or attempts at cover-ups or sweeping things under the rug as well as the section about the former factory itself that's now completely gone. But at this exhibition you can not only see images but also play videos that kind of shows the urban exploration of the ruined plant before it was demolished. In addition there's space for temporary exhibitions. When I visited there was one on the topic of Auschwitz. Being already quite familiar with that topic I did not inspect it in much depth, except for the section that concentrated directly on the Topf & Söhne personnel involved. This exhibition was all in German only. All in all I must say that even though the permanent exhibition here is very text-heavy and thus somewhat demanding, I still found it thoroughly fascinating and totally gripping. It's an angle of the Third Reich and the Holocaust that does not normally get much coverage, so this exhibition closes a very important gap. Required visiting! Location: just south of the inner Old Town of Erfurt, Thuringia, Germany. The address is: Sorbenweg 7, 99099 Erfurt. Details: To get to the site you can walk it from the centre of Erfurt, it's about a mile and a half (2.5 km) from the Domplatz at the heart of the Old Town, to its south-east. Only the final bit from the train tracks and along the main trunk road Weimarische Straße to Sorbenweg is not especially pleasant, but it's doable. From the main train station it is only 0.7 miles (1.1 km). From there you can also take a bus (line 9 in the direction of Daberstedt). Get out at the next stop (Spielbergtor) and walk up the road Nonnenrain. If you have your own vehicle, you can use the free parking spaces just behind the building. When I was there it was no problem at all getting a space. In fact there were no other visitors the entire time I was there. It's easy to navigate too, as Sorbenweg branches directly off the main trunk road leading in from the B7 (called Weimarer Straße here). Time required: Quite a bit, even though it is not large by area space, but if you want to read everything you'll need some two hours or more. Combinations with other dark destinations: The most obvious and also nearest major dark site related to this place is obviously the former concentration camp of Buchenwald, where you can see, amongst many other things, the crematoria with the ovens marked with the company logo of Topf & Söhne. It is either reached from Weimar (as described in the directions in the Buchenwald chapter) or, if driving from Erfurt, you can avoid Weimar by first turning off Weimarer Straße onto the B7 northbound, turn right at the next exit and carry on straight until you come to the village of Ballstedt, where you turn right, drive through Hottelstedt on the road Im Dorfe. Keep left to stay on this and it will take you to the memorial site's car park on your left. For sites further away see under Germany in general. Combinations with non-dark destinations: Erfurt is definitely worth a visit! It is Thuringia's capital and largest city and its Old Town core is one of the very few in Germany that is still largely intact – thanks to the fact that Erfurt escaped most of the heavy bombing of WWII. Thus there are plenty of original medieval buildings as well as the grand landmarks of the Dom (cathedral) and the Severikirche (St Severus Church) standing magnificently right next to each other. Nearby Weimar (see under Buchenwald > combinations) is much smaller and somewhat less grand, but also an important cultural centre (mainly thanks to its Goethe and Schiller connections). From here it's also not too far to the next bigger city, Leipzig. Those rather after nature instead of cities could head north from Erfurt to get to the Harz, the highest of the German “Mittelgebirge” (highlands/forested mountain range).